The Member Breeders listed below (jump to the list) are current ALAA Breeders in good standing with the Association. If you are looking to purchase a Labradoodle as a pet or as a breeding dog, be assured that this page contains the most up to date information about our Member Breeders. Our automated system updates the information on this page every 24 hours, so please check back often. PLEASE NOTE: Unfortunately, there are breeders who display the ALAA Logos illegally and who are not, or have never been, members of the ALAA. The ALAA highly recommends that you research any breeder you are considering. As an organization we are trying our best to protect our current Member Breeders, the consumer, and the Labradoodle Breed. This page. Only ALAA Member Breeders in good standing appear in the list below. Logos. All ALAA Member Breeders in good standing are issued new logos annually, and should be displaying a valid ALAA logo with a current date. Beware breeders using outdated/expired logos, as they are not authorized to do so. Submit all breeding dogs' pedigrees and minimum health testing for dogs in their program. Provide and honor purchase agreements and health warranties for all puppies sold. Register all litters produced in their program. Adhere to the ALAA Code of Ethics in business practices. Look for correct breeder information, valid dates. No current ALAA Member Breeder should be displaying any of these logos. 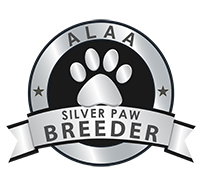 The ALAA also rewards Member Breeders who go above and beyond the minimum hip and elbow health testing requirements by issuing a Silver or Gold Paw Emblem. Member Breeders must repeat and maintain this level of health testing for all breeding dogs in their program in order to qualify for the Silver or Gold Paw. The appropriate qualifying Paw is shown next to the Member Breeder kennel name below, and this is updated automatically every 24 hours. 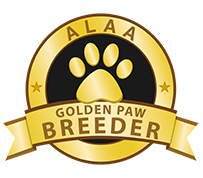 If a breeder is displaying the ALAA Silver or Gold Paw Emblem on their website, and it does not match the Paw Level displayed here, they are NOT currently eligible for that Gold or Silver Paw. Many breeders will ship around the world or on their continent, please consult each Member Breeder for their individual policies.